From left to right: Alex Jarrett of Pedal People, the late Ellinor Ostrom, and Rebekah Hanlon of Valley Green Feast. Photo courtesy of VAWC. Reading John Baldridge’s dissertation, the late Elinor Ostrom has been on my mind. She was incredible woman. 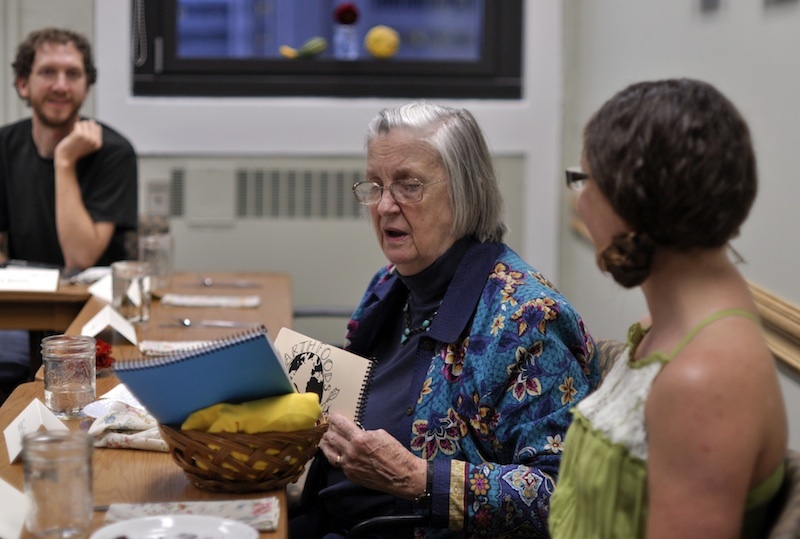 The Valley Alliance of Worker Co-operatives hosted Ostrom in September 2011 for dinner and conversation about research in collective action and co-op led development in the Valley. Earth Foods, a student run business at the University of Massachusetts catered a delicious dinner. Elinor Ostrom won a Nobel Prize in Economics for her work on collective action and governing the commons. I feel so lucky to have been there and met her before she passed away. This event was developed in collaboration with the University of Massachusetts Co-operative Enterprise Collaborative (UMCEC) and Michael Johnson’s work organizing a special issue of GEO (Grass Roots Economic Organizing) with contributions from The Ostrom Workshop and a Guest Introduction by Ostrom. I particularly enjoyed Johnson’s appreciative yet somewhat critical paper “Face-to-Face Communication and the Unexplored Potential of Co-operation”. John Baldridge’s dissertation is another great resource connecting Ostrom’s work with worker co-operative, it’s available here. Read more about this and other more recent VAWC events here.